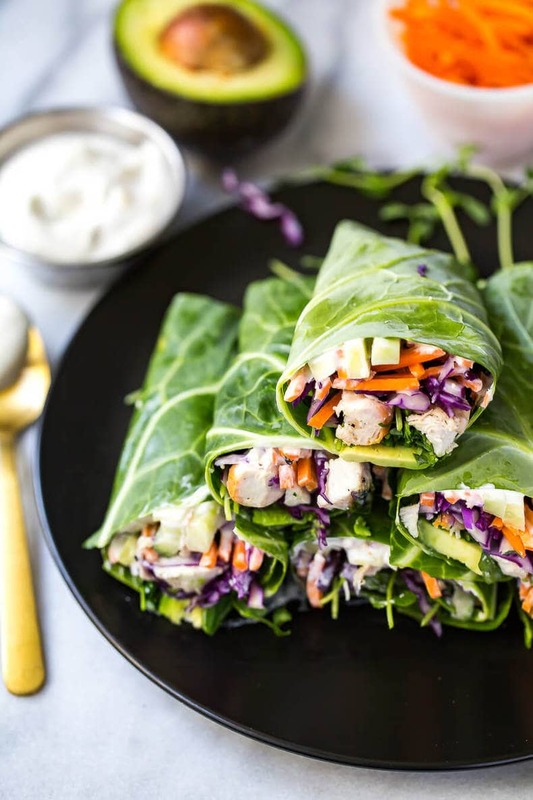 These Low Carb Garlic Chicken Collard Wraps are a delicious and healthy lunch idea jam-packed with veggies, avocado and a homemade vegan garlic sauce! 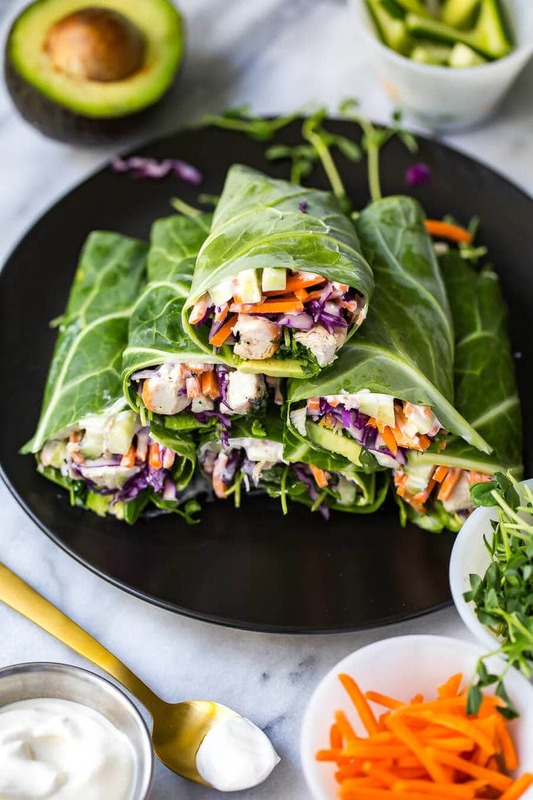 I feel like the ultimate health goddess bringing you these Low Carb Garlic Chicken Collard Wraps today. Consider it an apology for neglecting the blog all of last week, okay? Let me just say that I was at the most AMAZING tradeshow last week. It's hard to really put into words what my work means to me sometimes, because I feel like I have turned an all-encompassing hobby into a full time job and that means pushing myself too hard sometimes, even past the point where I'm burnt out and exhausted. 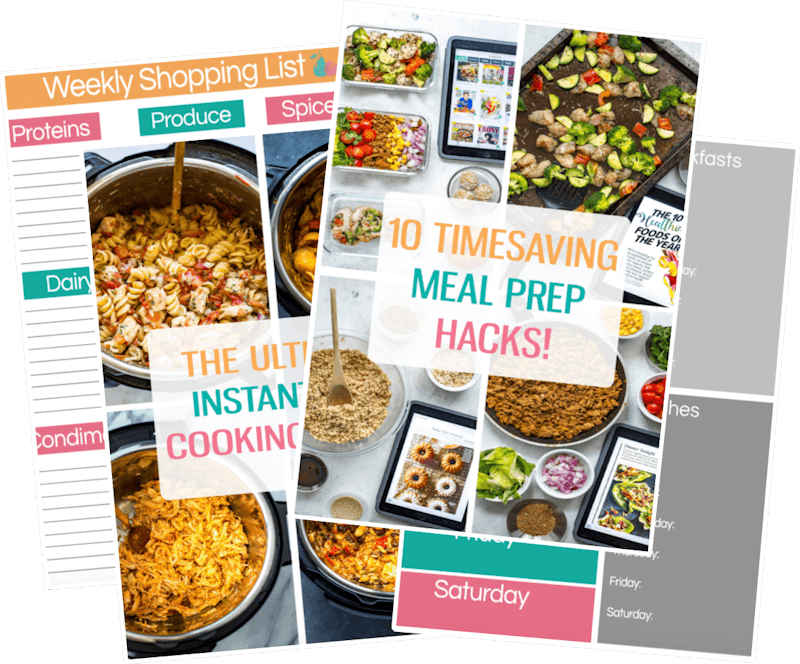 I had the opportunity to head to the Canadian Produce Marketing Association's (CPMA) yearly tradeshow at the Metro Toronto Convention Centre last week and let me tell you what a change in routine can do for a person! I think there's something to be said for entrepreneurs and non-stop work schedules. It's hard to get away from the day-to-day routine of computer work, emails, invoicing, scheduling, etc. and it honestly just drags me down sometimes and becomes overwhelming. I mean, don't get me wrong. I love having a routine for the sake of maintaining a diet that is relatively full of whole foods, and I love having a routine that allows me to get some regular exercise. But after a while we all need a little bit of a vacation right? Well, work trips are my version of a vacation right now, and I'm all about it! So, in keeping with my little change up of routine, here I am publishing these Garlic Chicken Collard Wraps, no bread or grains needed. I mean, I don't normally follow a set diet or limit what I feel I can and can't eat. I love me some carbs, don't get me wrong. 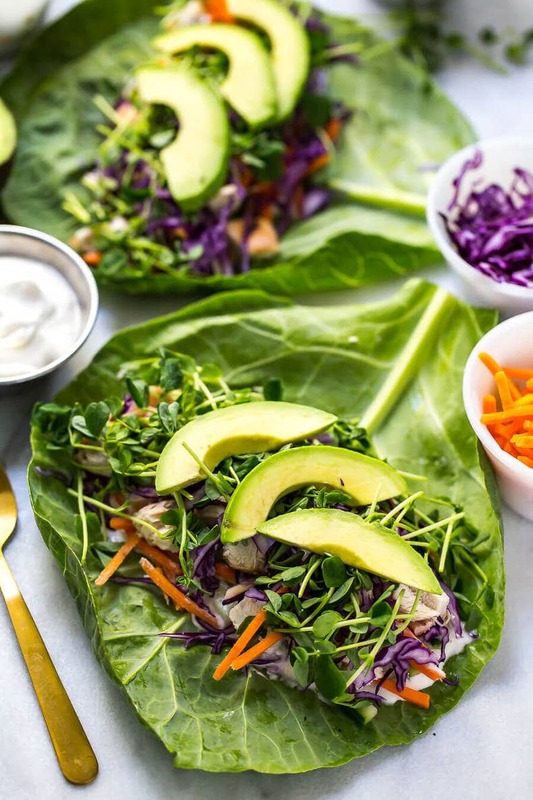 But these collard wraps are so crunchy and filled with flavour, you won't even notice that you're basically just eating salad rolled up into a wrap. 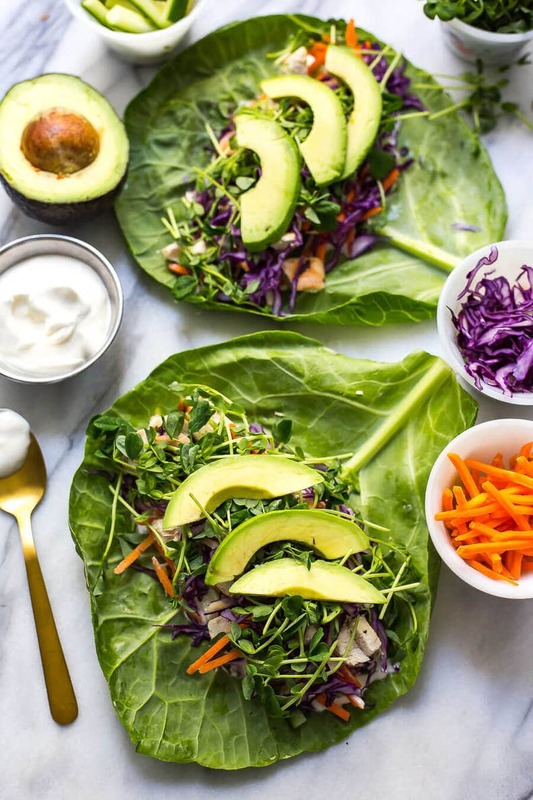 And the great thing about these collard wraps is that you can switch things up depending on what you have in your fridge. I would highly recommend keeping the avocado in though if at all possible, because DUH, avocado is amazinggggggg. 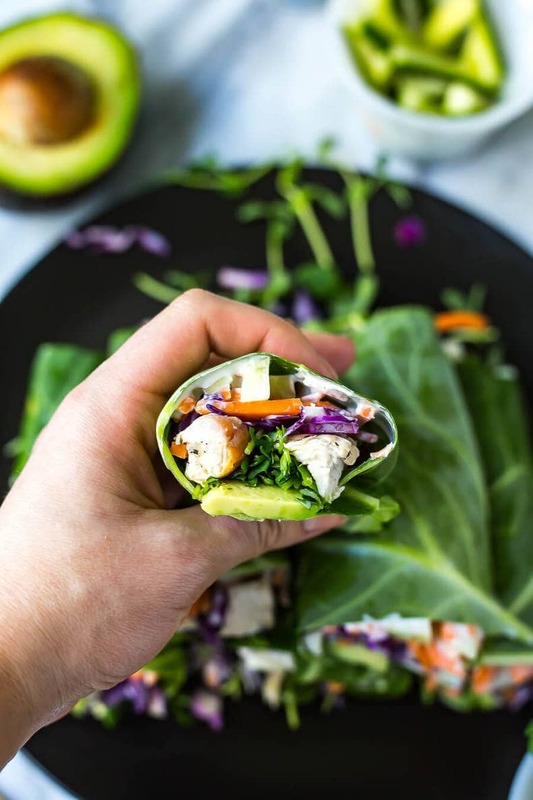 The smooth creaminess pairs so nicely with the crunchy veggies You can even technically use a chickpea mash to make these wraps low carb AND vegetarian! How's that for a healthy lunch?! Now, the hardest part of this whole recipe is getting the rolling of the wraps just right. I find it's easier to cut away a little bit of the stem and then roll from there, while putting just a little bit of filling in each wrap. From there, I'll eat about three of these wraps in one sitting for lunch. And the vegan garlic mayo is SO AMAZING. I've used it in a few recipes now, like my chicken shawarma recipe, and it just can't be beat. 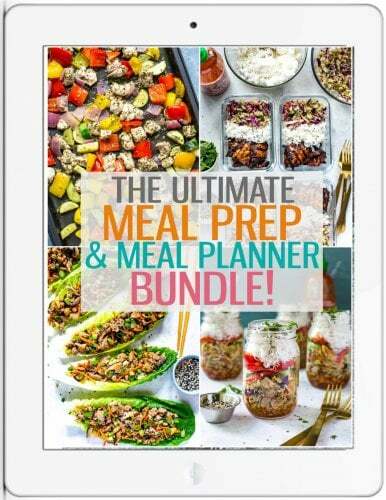 Of course you're more than allowed to be lazy and use storebought, or even a chipotle mayo would be amazing in here! I like having multiple little wraps because you can customize each flavour and have a ton of variety. Switch up the toppings in each one. Just do itttttttt. 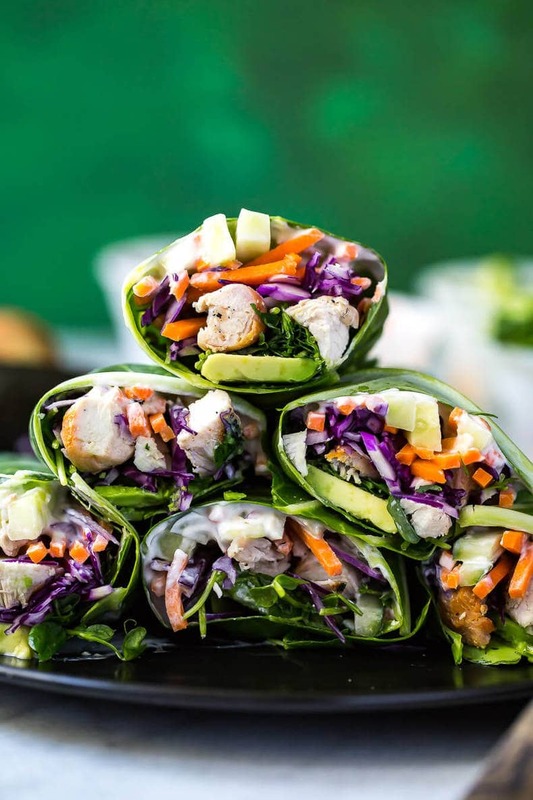 Will you be making these Low Carb Garlic Chicken Collard Wraps? Here's to more healthy, delicious lunches like these for the summer months! I am beyond in love with all the crunch and texture going on in these wraps. Preheat BBQ to med-high heat. Alternatively, preheat oven to 425 F. Brush chicken with a little bit of olive oil and sprinkle with salt and pepper. Grill for 7-8 min per side, or bake in an ovensafe dish for 20-25 min until chicken is fully cooked. Remove and set aside, slicing/dicing once cooled. Prepare veggies. Wash collard greens and lay open flat, gently cutting away as much of the stem in each leaf as possible. Spread with garlic mayo, then top with sliced chicken and the rest of the veggies. 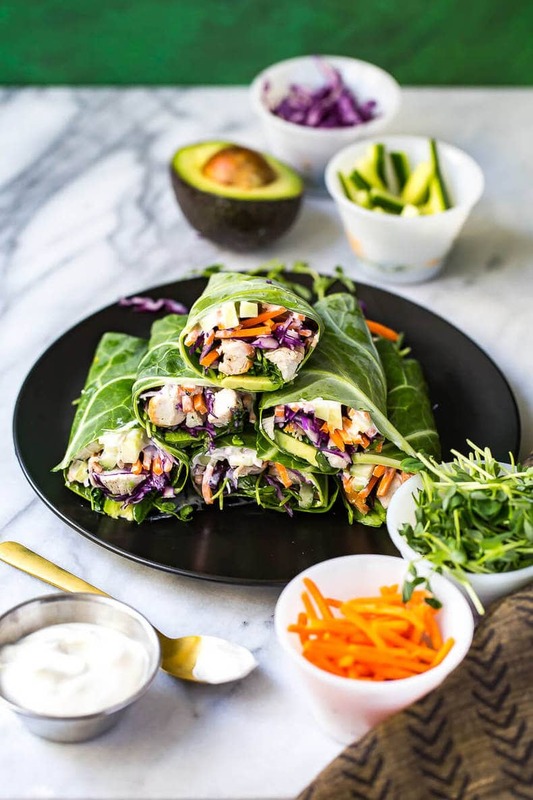 Top everything with avocado, then roll everything up into wraps. I personally prefer to make my wraps smaller and then eat 2-3 of them in one sitting as opposed to having one big wrap. I find it easier to eat and fold that way, so I don't add a ton of filling to each wrap. It's up to you what you prefer - just a tip! I’m loving everything about this recipe. And how fun that trade show must’ve been!! Jealous!